Want to fish for free in Ohio, without a state permit? Fish for free anywhere in the state May 4-5, in the annual free fishing weekend. Visitors can receive a 20 percent discount on campsites during Ohio Free Fishing Days by using the promotion code 19ANGLER at ohiostateparks.reserveamerica.com. 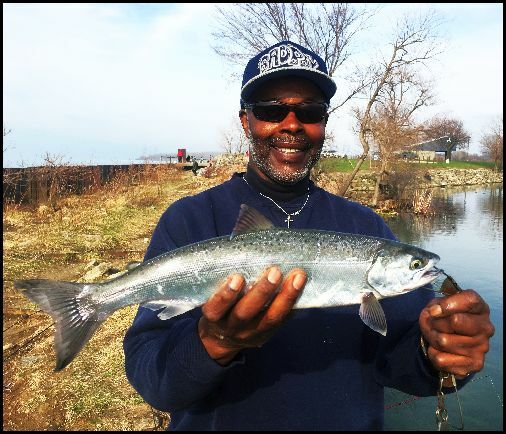 The breakwall at East 55th Street Marina, the old Coast Guard Station and rocks at Edgewater Park and East 72nd Street Marina offer a chance at steelhead, yellow perch, and variety of other species. Courtesy docks have been installed at Edgewater and Gordon park boat launches last week, Cleveland Metroparks aquatic biologist Mike Durkalec writes in his weekly fish report. These harbor areas are a good place to find pre-spawn northern pike and largemouth bass, as well as panfish. Beginning this boating season, public boat launch ramps at Rocky River, Edgewater, Gordon Park, and Wildwood will charge a fee ($5 daily or season pass for $30 for Cuyahoga county residents and $35 for out of county residents) for trailered watercraft. All proceeds benefit lakefront improvements projects. The Rocky and Chagrin rivers are offering good fishing conditions, especially steelhead fishing with a mix of fresh (pre-spawn), spawning, and post spawn steelhead. Steelhead in spring will bite a variety of offerings, including dime to nickel size spawn bags, 1/32-1/64-ounce marabou jigs under floats (black, pink, and white are top colors), beads that mimic salmon eggs, and flies (egg patterns and baitfish streamers are top producers), Durkalec writes. Enjoy steelhead season now because it will taper off quickly later this month. Complementing the steelhead are very good numbers of lake-run smallmouth bass, especially in deeper, rocky holes throughout the main branch of the river. The white sucker run is also going strong on local streams, Durkalec writes. Suckers are perfect for kids and less experienced anglers.